When gambling online, there seems to be more blackjack variations than you can poke a stick at. Super 21 Blackjack is yet another of those, but with fun twists on classic blackjack gameplay that has made this variation one of the most popular online blackjack games (hence the reason it’s often called “Super Fun 21”). 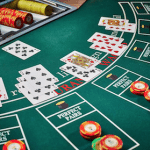 Players familiar with the rules of blackjack won’t have any problem adjusting to the the format of Super 21, while new players to the game will easily pick up the rules. Note: The online information on this page is intended for our international readers only. Following the introduction of the Interactive Gambling Amendment Bill in September 2017, online casinos are banned from accepting Australian players. For Aussies, the content on this page is informational in nature only. International players can play Super 21 at many of our top-rated online casinos for free in practice mode so you can get the hang of it before moving on to play for real money bets. Like traditional blackjack, the aim of Super 21 is to make a hand with a total value that’s closer to 21 than the dealers hand but without exceeding 21. Typically a standard deck of 52 cards excluding the jokers is used, however you can use one, two or six decks. 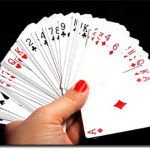 Aces are valued at either one or 11 and face cards are valued at 10. Bets are placed and the player is dealt two face down cards. The dealer is also dealt two cards but with one face up and one face down. The player looks at their cards and then has the option to hit (receive another card) or stand (decline additional cards). If the player goes over 21 they have bust and lose their wager, however if they hit a blackjack of 21 or their hand is closer to 21 than the dealer they win. Double – you can double your bet after receiving your first two cards if you think your three card hand stands a better chance of beating the dealer. Split – if the first two cards in your hand are of equal value, you have the option of placing another bet and splitting your cards into two separate hands. You can draw as many additional cards on each split hand as you like, except if you draw an ace, in which case you can only receive one more card. 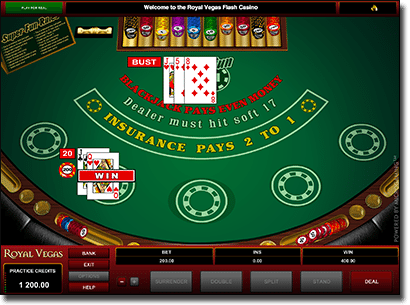 Insurance – some online Super 21 games may offer the option of insurance, which occurs when the dealer shows a face-up Ace card. In this case you can choose to insure against the dealer by placing an additional bet of half of your initial wager. If the dealer has a blackjack, you are paid two to one on your insurance bet but if there is no blackjack you lose your insurance wager. Not all games offer insurance, so check with the terms of the game you are playing if this is an option you intend to use. Surrender – some games also offer the option to Surrender. This means that at any time during the game you can abandon your hand and recover half of your wager, automatically losing the other half of your bet to the house. What’s the difference between Super 21 and Classic Blackjack? Betting on Super 21 is dictated by the minimum and maximum betting limits of each game. You’ll generally find more leniency in betting amounts online than you will when playing Super 21 in a land based casino. The strategies for winning Super 21 are generally the same as classic blackjack strategy. You can brush up on your blackjack strategy knowledge here. The blackjack strategy unique to Super 21 is to try and take advantage of one of the special bets, like the five card 21 or Six Card Charlie. Aiming to win these bonuses will alter your blackjack strategy but are half the fun of playing the Super 21 variation of blackjack.